The 25th annual Stamp Out Hunger Food Drive will take place on May 13, 2017. That’s the day when people across the countryleave cans and boxes of food for their letter carriers to collect. Ever wonder what happens with all that food? In our area, it goes to the Blue Ridge Area Food Bank, and it takes a small army of volunteers to get it there. All of the donated food will be sorted at our main post office, and then packed up for delivery to the food bank. Stamp Out Hunger, the nation’s largest single-day food drive, was created by the National Association of Letter Carriers in response to the needs they saw every day on their routes. 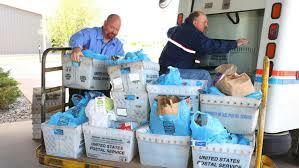 Last year, the letter carriers collected a record 80 million pounds of nonperishable food nationwide. The event is well timed, too. As the end of the school year approaches, thousands of children who rely on free and reduced school breakfasts and lunches will go hungry this summer without your help. Please contact Caroline Emerson, United Way-Thomas Jefferson Area, at cemerson@unitedwaytja.org or 434-972-1701 to sign up. Volunteers must be 16 or older and must be able to commit to a 2-hour time slot, rain or shine. Sturdy closed-toed shoes are a must. You must be fit enough to lift 20-pound boxes many times during your shift. Please don’t forget to leave a bag of non-perishable food for your letter carrier. Here’s a link to all the info you need about how to make a donation. Thank you for helping to feed our community!